Objective: To review critically the history of Australian tobacco industry efforts to avoid, delay, and dilute pack warnings on cigarettes. Design: Systematic keyword and opportunistic website searches of tobacco industry internal documents made available through the Master Settlement Agreement. Results: Four industry strategies and six recurrent arguments used by the industry are described, which were used to thwart the passage of three generations of health warnings (implemented in 1973, 1987, and 1995). These strategies are shown to have been associated with major delays in the implementation of the warnings and in keeping them inconspicuous, unattributed to the industry and non-specific, and particularly in delaying the use of warnings about addiction. The industry today continues to oppose warnings, which might “repel” smokers from tobacco use. Conclusions: Efforts by governments to introduce potent health warnings will be resisted by the tobacco industry. Tobacco control advocates should anticipate and counter the strategies and arguments used by the industry, which are described in this paper if they wish to maximise the use of the pack as a vehicle for raising awareness about the harms of smoking. The right to information about goods and services sold in the marketplace is one of eight fundamental consumerist principles.1 Tobacco products, in causing their immense global death toll, are exceptionally strong candidates for the fullest application of this principle. Warnings and consumer advice on packaging about safe usage, handling and disposal, dosage, contraindications, and emergency procedures have a long history in the regulation of the marketplace. The tobacco industry provides a case study of fundamental resistance to this principle. Globally, efforts to avoid and weaken health warning proposals have been accorded very high priority by the tobacco industry. In 1978, British American Tobacco (BAT) UK director Stewart Lockhart wrote to a German colleague:“...we can expect health warnings on all tobacco products in your country within a fairly short time, and this is very much to be regretted. Obviously the Group policy should be to avoid health warnings on all tobacco products for just as long as we can.”2 In this paper we discuss strategies employed by the Australian industry to avoid, delay, and dilute warnings, showing that once the global momentum for warnings made them inevitable, the industry’s primary focus was to keep warnings as general, non-disease specific, and inconspicuous as possible, with a particular concern to avoid warning smokers that nicotine was addictive. We first provide a brief history of warnings in Australia, and then review arguments and strategies used by the Australian industry to oppose warnings. The paper is drawn from extensive searches of internal tobacco industry documents conducted during 2001–2003 on the Master Settlement Agreement websites (http://www.tobaccoarchive.com/), sites containing documents from BAT and its affiliates at the Guildford, UK document depository, and from a collection of Australian tobacco retail trade journals. A full description of the searching methods used can be found at http://tobacco.health.usyd.edu.au/site/gateway/docs/research.htm#search. Despite this, the Australian industry aggressively resisted warnings from the late 1960s to the 1990s. Australia has seen three generations of tobacco product pack warnings (figs 1–3), each bitterly contested by the industry. First generation of health warnings on cigarette packs. In June 1969, legislation was introduced into the Australian Federal parliament enabling a warning to appear on cigarette packs. However, Australia’s eight states and territory governments each needed to pass their own legislation before warnings could be introduced. State enactment was inconsistent, partly reflecting intense industry lobbying. PM’s public relations manager, Andrew Whist, wrote to his New York headquarters that because of “...New South Wales’ refusal to legislate...we...appear to have won some time...it is hard to see how pack labelling could practicably be enforced during 1970”.8 Industry lobbying effectively delayed the introduction of the inaugural warning by 52 months: the legislation was not implemented nationally until January 1973, when the small, inconspicuous statement:“Warning. Smoking is a health hazard” appeared (fig 1). Health officials soon began advocating for the bland and non-specific warning to be strengthened. Following a decade of lobbying from health groups, in May 1985, Australian health ministers agreed to introduce four different warnings. Those initially agreed were:“Smoking kills”, “Smoking is addictive”, “Smoking causes lung cancer and heart disease”, and “Smoking damages your lungs”. These were to take up 20% of the front and back of the pack, and appeared in white type on a black background. Again the industry resisted, particularly with regard to “Smoking is addictive”(see below). 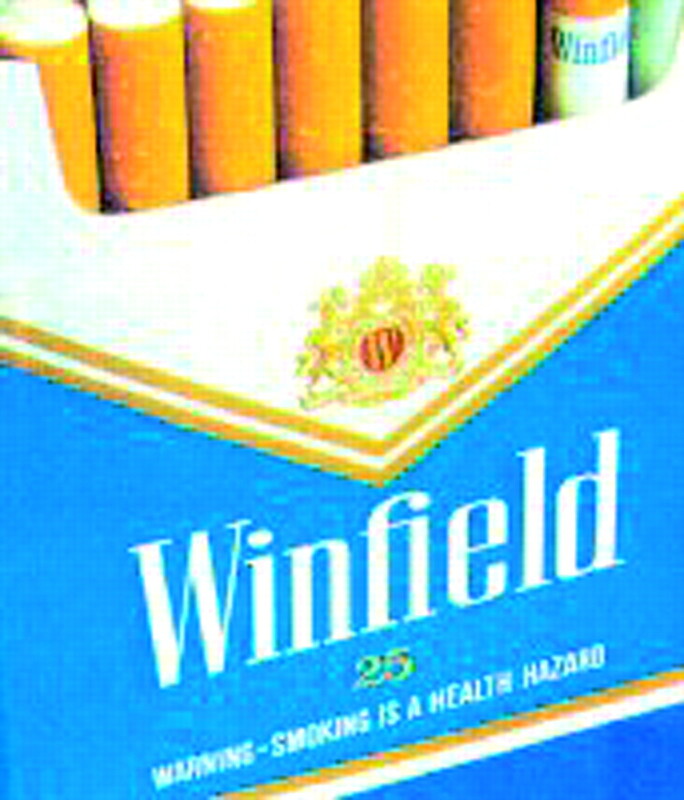 In 1985, a Tobacco Institute of Australia (TIA) publication declared:“At a top level meeting of industry executives, it was decided that all proposals [on new health warnings] would be opposed and the overturn of decisions sought.”9 This obstructive policy was implemented, resulting in the then Federal Minister for Health, Neal Blewett, observing:“Ministers have conducted detailed negotiations with the tobacco industry in a sincere effort to reach agreement. Despite our willingness to reach an agreed position, I regret that the industry was unable to make any serious attempt to compromise.”10 After further industry opposition causing the abandonment of “Smoking is addictive” and “Smoking kills”, four rotating warnings were finally introduced in January 1987 with an agreement that the health ministers would not seek further amendments for five years. The new warnings (fig 2) were:“Smoking causes lung cancer”;“Smoking damages your lungs”;“Smoking causes heart disease”; and a warning widely considered a “soft” compromise:“Smoking reduces your fitness”. Second generation of health warnings on cigarette packs. The Centre for Behavioural Research in Cancer (CBRC) was commissioned by the inter-government Tobacco Issues Committee to produce a report on which health warnings were likely to be most effective with youth.13 Included among the CBRC’s 12 recommended warnings were the two rejected by the industry in 1985:“Smoking kills” and “Smoking is addictive”. These were to occupy at least 25% of the front of the pack, and appear on the “flip-top” instead of at the foot of the pack. 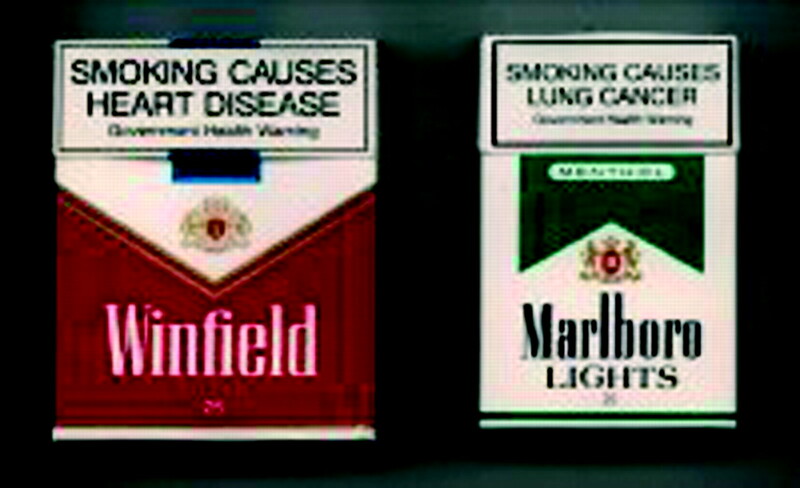 In addition, the entire back of the pack was to carry detailed information about the health effects of smoking.13 Massive industry resources were devoted to fighting these proposals, and practically all documents available from this period are correspondence between the Australian and USA offices of PM, indicating the intense concerns held for the global repercussions of the new warnings. PM’s international CEO Geoff Bible wrote to PM Australia’s CEO, David Davies:“it is imperative that this initiative be stopped”14 and was reassured that “all concerned in Australia are well aware of the importance of the issue”.15 The industry strategy distilled into the primary objective of ensuring that relatively weak European warnings were introduced rather than the proposed tough warnings. Despite aggressive lobbying to this end, a compromise set of proposals was approved by all eight states and territories for their own legislation. Six of the proposed 12 rotating warnings were dropped and the size of the back panel information reduced to one third of this panel.16 The new warnings were to take effect from 1 April 1994,17 but after further opposition, were finally introduced in January 1995 (fig 3). Third generation of health warnings on cigarette packs. The industry’s main objectives over health warnings were to first avoid them completely, but then when momentum for their introduction made them inevitable, to ensure that they were not attributed to the industry, but to government, and to weaken the texts that were used. Since at least 1975, the international industry had warned its members of the “...disastrous consequences that would result from any Group Company voluntarily accepting a warning on packs or advertisements which was not attributed to government or the medical authorities. An unattributed warning, imposed by legislation, would not of course place the Group Companies at risk in the same way; since the Company would be complying with the law rather than associating itself with the view expressed in the text of the warning. It is strongly recommended...that under no circumstances should any Group Company accept voluntarily unattributed warnings ...”.18 This government attribution would allow the industry to claim that while smokers had been warned, the warnings were mandated by the government, and were not put there by the industry, thus allowing them to continue to publicly dispute the claims being made and to thereby confuse smokers. Up until 1992, 60% of BATCo’s international cigarette production carried no pack warnings.22 When warnings were extended to all brands, BATCo claimed that the “inconsistency” was being “corrected” because of “community expectations”.23 Despite the fact that the industry had often been at pains to disown health warnings as government impositions, they blamed the past “inconsistency” on “government initiatives”. In never-say-die spirit, PM’s Henry Goldberg wrote to Jeff Kennett noting that the MCDS recommendations were contrary to the position Kennett had stated publicly would be Victoria’s position (that is, adopting the EEC warnings). Goldberg argued that “proposals to radically alter packaging will do nothing to increase this awareness [of the health risks of smoking] and will do nothing to address concerns about smoking incidence in young people” as well as appealing to Kennett’s strongly conservative political agenda by framing warnings as an unfair burden on business.46 Goldberg’s position here was disingenuous. His purported concern about the new warnings failing to increase awareness and dissuade young people from smoking applied even more to the smaller, inconspicuous warnings PM had been promoting via Kennett. Similarly, his reference to “an extremely burdensome and expensive regime” can be put in context when considering that Australian tobacco companies had produced special packaging for Qantas in-flight sales, and for small export markets such as the Solomon Islands (total population 354 000).46 When it suited their marketing plans, they were able to alter packaging for these small markets without suffering the alleged “extreme” burden said to be involved. In 1992, in response to the CBRC’s report proposing third generation warnings, the industry commissioned a series of critiques of the CBRC report through its lawyers.55–61 With these as ammunition, on 18 June 1992, the TIA filed legal proceedings against the Anti Cancer Council of Victoria (authors of the CBRC report on labelling) seeking declaration that the report was misleading and deceptive and seeking an injunction to prevent its further distribution. warnings desecrate pack design and branding. If warnings were indeed counterproductive to intentions to dissuade people from smoking, then the tobacco industry would surely have been advocating for the most brazen warnings possible. That it coached its employees in providing the opposite advice can only indicate that it understood that warnings were against its interests—that is, were likely to depress demand. Significantly, an industry submission argued that different brands were “essentially the same product” so that “brand presentation [becomes] supremely important. Brands are designed to satisfy the expectations and perceptions of smokers about the product they choose to buy”.28 This was an intriguing argument to advance as a reason to keep health warnings minimal. Presumably it was an obtuse way of saying that the industry felt it important to avoid changes that would challenge smokers’ expectations and perceptions that smoking was benign by the imposition of larger more explicit warnings that would draw smokers’ attentions far more than previously. We have reviewed the 26 year history (1969–1995) of Australian tobacco industry efforts to first totally avoid, and then to dilute, delay, and disrupt the implementation of three generations of health warnings. Opposition to health warnings came from the highest possible echelons in the industry. The motivation for the opposition changed over time from one of point blank rejection of any warning, followed by efforts to keep warnings small, non-specific, and avoiding any mention of addiction, through to explicit concern that proposed formats might be off-putting to smokers. The international tobacco industry’s historical opposition to pack warnings that hold potential to motivate smokers to quit is well appreciated by those active in tobacco control. Australia was among the first nations to propose large, prominent and disease specific pack warnings, including one on addiction. The international tobacco industry was greatly concerned to halt this development lest it establish precedents for other nations. Detailed analysis of the tobacco industry’s own account of its strategies and arguments for avoiding and weakening health warnings are elaborated for the first time. The industry’ successes in achieving the delays and dilutions described meant that millions of commencing and continuing smokers in Australia were insulated from proposed explicit statements that otherwise could have accompanied each and every tobacco purchase. The Australian industry could have elected to follow the lead of the US in adopting health warnings from 1966, but worked to delay the introduction of the first warning for eight years (1973). The “addiction” warning was first proposed for Australian packs in 1985, but did not appear for another 12 years, during and after which the industry repeatedly made public statements that nicotine was not addictive. The evidence we have presented will be useful to litigants against the tobacco industry who will be able to point to industry efforts to prevent and delay explicit warnings reaching consumers. What of the future? The industry’s own documents suggest that tactics such as attacks through international trade agreements, and the provision of covers for packs bearing warnings, may be used in the future. This research was funded by grants from the US National Institutes of Health (R01 CA87110–01A1) and the Australian National Health and Medical Research Council (153857). Consumers International. Rights and responsibilitieshttp://www.consumersinternational.org/about_CI/#rights (Accessed 23 May 2003). Lockhart C. Health warnings Germany [Letter to D. von Specht]. 21 Jul 1978. British American Tobacco. Bates No. 301082507. http://tobacco.health.usyd.edu.au/tds/BAT301082507 (Accessed 27 Feb 2003). Bernstein Research. Implications of Battelle Hippo 1 & 11 and the Griffith Filter. 17 Jul 1963. Philip Morris. Bates No. 2023191000/1003. Felton D. [Letter to Dr W.R. Fordyce, British Tobacco Co (Australia) Ltd]. 15 Jan 1969. British American Tobacco. Bates No. 100425422/5425. http://outside.cdc.gov:8080/BASIS/ncctld/web/mnimages/EDW?W = DETAILSID = 752 (Accessed 23 May 2003). Tingle L. Cabinet failed to alert nation to dangers of smoking cigarettes. The Australian1 Jan 1996:4. Warning sought on cigarettes. Tobacco Journal (Victoria)Aug 1967:14. Tyrrell I. Deadly enemies: tobacco and its opponents in Australia. Sydney: UNSW Press, 1999. Whist A. Letter No. A37 [Letter to A. Holtzman, Assistant General Counsel, Philip Morris International]. 2 Apr 1970. Philip Morris. Bates No. 2015047992/7997. http://legacy.library.ucsf.edu/tid/pvr53e00. Industry to fight new warnings. Tobacco Australia1985;2(2)Jun:1. Blewett N. Tobacco product health warnings [press release]. Canberra Office of the Federal Minister for Health, 1985. Borland R, Hill D. The path to Australia’s tobacco health warnings. Addiction1997;92:1151–7. Bible G. Notes on meeting with Bill Ryan. 16 Dec 1992. Philip Morris. Bates No. 2500051256/1258. http://legacy.library.ucsf.edu/tid/tvj02a00. National Campaign Against Drug Abuse (Australia). Tobacco labelling reforms give consumers more information [press release]. 15 Apr 1992. Philip Morris. Bates No. 2023248487/8489. http://legacy.library.ucsf.edu/tid/zye78e00. Bible G. Australia [Inter-office correspondence to D. Davies]. Philip Morris. 3 Mar 1993. Philip Morris. Bates No. 2047896065A/6071. http://legacy.library.ucsf.edu/tid/bzo07e00. Webb W. Australia health warning regulations [Fax to G. Bible, Philip Morris International]. 23 Apr 1993. Philip Morris. Bates No. 2500060573. http://legacy.library.ucsf.edu/tid/kti19e00. Henry S. Ministers weaken cigarette warnings. The Australian 8 Jul 1993. Philip Morris. Bates No. 2045680497. http://legacy.library.ucsf.edu/tid/mlr52e00. National Drug Strategy (Australia). Cigarette packs to carry tougher health warnings. 7 Jul 1993. Philip Morris. Bates No. 2500149172/9173. http://legacy.library.ucsf.edu/tid/cul19e00. Hargrove G. Smoking and health [Memo to all No. 1s of associated companies]. 20 Jun 1975. British American Tobacco. Bates No. 302058583. http://www.library.ucsf.edu/tobacco/batco/html/9300/9318/ (Accessed 23 May 2003). Philip Morris, British-American Tobacco Company. Position paper [Drafted by BAT and Philip Morris for presentation at Operation Berkshire]. 25 Apr 1977. Philip Morris. Bates No. 1000219775/9780. http://legacy.library.ucsf.edu/tid/oee84e00. Ely R. Warning labels—USA [Letter to all No. 1s of operating companies]. 20 Jun 1984. British American Tobacco. Bates No. 100145188. http://www.moh.hnet.bc.ca/guildford/pdf/125/00012608.pdf (Accessed 23 May 2003). Previati L. Health warnings on packs. 18 Mar 1992. British American Tobacco. Bates No. 503934063/4064. http://www.moh.hnet.bc.ca/guildford/html/bat/122/00012234.html (Accessed 13 Jun 2003). Bacon D. British-American Tobacco Company extends health warnings [media statement]. 10 Feb 1992. British American Tobacco. Bates No. 503934066. http://www.moh.hnet.bc.ca/guildford/html/bat/122/00012236.html (Accessed 13 June 2003). Pollak L. Australian warning labels [Inter-office correspondence to D. Davies]. 17 Jan 1994. Philip Morris. Bates No. 2500040779. http://legacy.library.ucsf.edu/tid/fsj02a00. Pollak L. EC warning labels [Attachment for the inter-office correspondence to D. Davies concerning Australian health warnings]. 17 Jan 1994. Philip Morris. Bates No. 2500040780. http://legacy.library.ucsf.edu/tid/gsj02a00. Pollak L. Annex list of health warnings referred to in the first indent of article 4 (2) [Fax to PM EEC Legal]. 12 Jan 1994. Philip Morris. Bates No. 2500040782. http://legacy.library.ucsf.edu/tid/xag42e00. Australian Tobacco Manufacturing Industry. Arguments in support of the tobacco industry case against health warning labels on cigarette packets and the banning of cigarette advertising. Jul 1969. Philip Morris. Bates No. 2025037010/7024. http://legacy.library.ucsf.edu/tid/urk87e00. Tobacco Institute of Australia. The Tobacco Industry’s position on proposed new rotating health warnings on tobacco products and advertising. 7 Jun 1985. Philip Morris. Bates No. 2500009158/9187. http://legacy.library.ucsf.edu/tid/isi42e00. Corti A. Labelling. INFOTAB. 21 Apr 1988. Philip Morris. Bates No. 2500009157. http://legacy.library.ucsf.edu/tid/hsi42e00. Roy Morgan Research. Australians want warnings on cigarette packages [published findings from Roy Morgan Research, April 1972]. 1972. Philip Morris. Bates No. 2025036621. http://legacy.library.ucsf.edu/tid/agq25e00. Maxwell H. Smoking & health—Australia. 26 Jul 1972. Philip Morris. Bates No. 2024258940. http://legacy.library.ucsf.edu/tid/jol98e00. The Bulletin Smoking out the tobacco lobby. 6 May 1972. Philip Morris. Bates No. 2025037059. http://legacy.library.ucsf.edu/tid/amo04e00. Whist A. Letter No. A66 [Letter to A. Holtzman, Assistant General Counsel, Philip Morris International]. 5 Jun 1970. Philip Morris. Bates No. 2015047999/8002. http://legacy.library.ucsf.edu/tid/jxb77e00. Murray W. [Letter to Hon. N. Greiner, Premier of NSW]. 26 Jun 1992. Philip Morris. Bates No. 2500050554/0556. http://legacy.library.ucsf.edu/tid/ifj19e00. Winokur M. Australia update [Email message to C. Fuller]. 3 Dec 1992. Philip Morris. Bates No. 2047896077/6078. http://legacy.library.ucsf.edu/tid/adt81f00. Winokur M. Australia update [Forwarding email message to T.J. Coll]. 9 Dec 1992. Philip Morris. Bates No. 2047896082A/6083. http://legacy.library.ucsf.edu/tid/wyo07e00. Winokur M. Australia HW labels [Email message to G. Bible]. 23 Mar 1993. Philip Morris. Bates No. 2045680523. http://legacy.library.ucsf.edu/tid/slr52e00. Francis P. Health warnings and contents labelling: status report no. 4 [Email to G. Bible, Philip Morris International]. 11 Mar 1993. Philip Morris. Bates No. 2045680531/0532. http://legacy.library.ucsf.edu/tid/cyc96e00. British-American Tobacco Company. Meeting with Victorian Premier Jeff Kennett re: Australian health warnings: file note. 15 Jul 1993. British American Tobacco. Bates No. 304030298. http://www.library.ucsf.edu/tobacco/batco/html/100/111 (Accessed 23 May 2003). Bible G. [Western] Australia—health warning [Fax to R.W. Murray]. Philip Morris. 11 Jan 1993. Philip Morris. Bates No. 2500060782. http://legacy.library.ucsf.edu/tid/cti19e00. Francis P. Health warnings and contents labelling: status report no. 2 [Memo to G. Bible, Philip Morris International]. 25 Feb 1993. Philip Morris. Bates No. 2500060792/0793. http://legacy.library.ucsf.edu/tid/xsi19e00. Francis P. Health warnings and contents labelling [Email to G. Bible, Philip Morris International]. 19 Mar 1993. Philip Morris. Bates No. 2045680525. http://legacy.library.ucsf.edu/tid/eyc96e00. Goldberg H. One Australia: potential use [Fax to G. Bible, Philip Morris International]. 15 Mar 1993. Philip Morris. Bates No. 2045680526/0527. http://legacy.library.ucsf.edu/tid/fyc96e. Davies D. Outcome MCDS meeting [Memo to W. Webb]. 7 Jul 1993. Philip Morris. Bates No. 2045680506. http://legacy.library.ucsf.edu/tid/kyc96e00. Davies D. MCDS labelling [Inter-office memo to W. Webb]. 8 Jul 1993. Philip Morris. Bates No. 2500119409/9410. http://legacy.library.ucsf.edu/tid/sck19e00. Goldberg H. [Letter to the Hon. J.G. Kennett, Premier of Victoria]. 8 Jul 1993. Philip Morris. Bates No. 2045680499/0500. http://legacy.library.ucsf.edu/tid/olr52e00. Oostrom D. [Fax to BATCo Ltd enclosing document titled ‘Consumer research summary: qualitative research on new health warnings Australia’ prepared by T. Valenzuela]. 2 May 1995. British American Tobacco. Bates No. 502559553/9555. http://tobacco.health.usyd.edu.au/tds/BAT502559553_9555 (Accessed 23 May 2003). Riordan M. Pack labelling: Fightback Campaign [Fax to D. Bacon, BATCo, Millbank]. W.D. & H.O. Wills (Australia) Limited. 12 May 1994. British American Tobacco. Bates No. 502562856/2869. Accessed 23 May 2003. http://www.library.ucsf.edu/tobacco/batco/html/100/169/. Philip Morris (Australia) Limited. Australia: smoking and health strategy: some recent developments in Australia. Feb 1978. Philip Morris. Bates No. 2024978017/8048. http://legacy.library.ucsf.edu/tid/loh24e00. Examiner (Launceston, Tas.). Health warning worries sports. 8 Jul 1975. Philip Morris. Bates No. 2021210156. http://legacy.library.ucsf.edu/tid/tvb85e00. Mercury (Hobart, Tas.). Cigarette warnings. 24 Jul 1975. Philip Morris. Bates No. 2021210166. http://legacy.library.ucsf.edu/tid/gvb85e00. Francis P. Health warnings [Letter to M. Winokur, Philip Morris International]. 30 Jun 1992. Philip Morris. Bates No. 2048203886/3891. http://legacy.library.ucsf.edu/tid/iro16e00. Bible G. Health warnings and contents labelling: status report no. 4 [Fax to P. Francis, Philip Morris (Australia) Limited]. Philip Morris Companies Inc. 11 Mar 1993. Philip Morris. Bates No. 2045680530. http://legacy.library.ucsf.edu/tid/byc96e00. Webb W. Western Australia health warning regulations [Fax to G. Bible, Philip Morris International]. 5 Jan 1993. Philip Morris. Bates No. 2500060830. http://legacy.library.ucsf.edu/tid/wsi19e00. Crabbe B. Comments on CBRC report “Health warnings and contents labelling on tobacco products”. University of Sydney, Department of Psychology. 14 Sep 1992. Philip Morris. Bates No. 2504091642/1669. http://legacy.library.ucsf.edu/tid/brh29e00. Price Waterhouse Economic Studies and Strategies Unit. Health warnings and contents labelling on tobacco products: comment on the report by the Centre for Behavioural Research in Cancer. Price Waterhouse Economic Studies and Strategies Unit. Aug 1992. Philip Morris. Bates No. 2504091715/1738. http://legacy.library.ucsf.edu/tid/zqh29e00. Cooney G. Health warnings and contents labelling on tobacco products: report on research conducted by the Centre for Behavioural Research in Cancer. Macquarie University, School of Behavioural Sciences. Aug 1992. Philip Morris. Bates No. 2504091740/1747. http://legacy.library.ucsf.edu/tid/sqh29e00. Lyle J. Health warnings and contents labelling on tobacco products: an evaluation. University of Sydney. Jun 1992. Philip Morris. Bates No. 2504091755/1795. http://legacy.library.ucsf.edu/tid/vqh29e00. Mengersen K, Tweedie R. Review of three studies into health warnings on cigarette packs and comments on Dr. R. Power’s discussion. University of Central Queensland and Colorado State University. 22 May 1992. Philip Morris. Bates No. 2023248896/8904. http://legacy.library.ucsf.edu/tid/wye78e00. Tobacco Institute of Australia. Independent comments on the report by the Centre for Behavioural Research in Cancer ‘Labelling on tobacco products’. Oct 1992. Philip Morris. Bates No. 2504091577/1578. http://legacy.library.ucsf.edu/tid/krh29e00. Tobacco Institute of Australia. Health warnings and contents labelling on tobacco products [extracts from expert reports provided to the Tobacco Institute]. Oct 1992. Philip Morris. Bates No. 2504091580/1583. http://legacy.library.ucsf.edu/tid/mrh29e00. ANOP Research Services Pty Ltd. Health warnings attitude survey 1993: top-line results of national study: presented to Clayton Utz. 16 Jun 1993. Philip Morris. Bates No. 2500060488/0508. http://legacy.library.ucsf.edu/tid/oti19e00. Philip Morris (Australia) Limited. Tobacco and Australia: a question of balance. Feb 1994. Philip Morris. Bates No. 2065184558/4611. http://legacy.library.ucsf.edu/tid/njq47d00. Irish RA. Chairman’s address, Rothman’s Pall Mall (Aust.) Ltd. Tobacco trade journal (Queensland)5 Oct 1972:4–5. Knopick P. [Memorandum to W. Kloepfer]. 9 Sep 1980. Tobacco Institute. Bates No. TIMN0107822/7823. http://legacy.library.ucsf.edu/tid/yol92f00. Glantz SA, Slade J, Bero LA, et al.The cigarette papers. Berkeley, California: University of California Press, 1996. Anon. Smoking and health: industry point of view. South Australian Tobacco JournalMay 1970:16,20. Anon. Victoria adopts cigarette warnings. Tobacco journal (Victoria)Apr 1972:5. Whist A. Notes for conversations with state politicians: subject—proposed health warning legislation. 30 Sep 1975. Philip Morris. Bates No. 2021210137/0140. http://legacy.library.ucsf.edu/tid/gxq53e00. Clarke B. Radio broadcast: on-air comments. 9: 12am, on Jeremy Cordeaux program. Radio 5DN, Adelaide, 1986. Woodward S. Small markets for Australian tobacco products [Memo to C. Reynolds, ASH Australia], 1986. Tobacco Institute (US). [Scientific experts present evidence to U.S. Congress showing no need for strengthening health warnings on cigarettes: press release]. 30 Apr 1969. Tobacco Institute. Bates No. TIMN0120908/0912. http://legacy.library.ucsf.edu/tid/nog92f00. ICOSI Task Force. Background briefing: effect of warning labels on cigarette use is questionable. 11 Jun 1979. Tobacco Institute. Bates No. TIMN0252012/2017. http://legacy.library.ucsf.edu/tid/nwe72f00. Philip Morris. Questions and answers concerning tobacco constituents and ingredients. 1990. Philip Morris. Bates No. 2025372335/2352. http://legacy.library.ucsf.edu/tid/huq95e00. Webb W. Australia corporate affairs [Cover page of fax sent to G. Bible, Philip Morris International on December 4, 1992 concerning a political meeting]. 4 Dec 1992. Philip Morris. Bates No. 2048203746. http://legacy.library.ucsf.edu/tid/qro16e00. Brownbill G. [Letter to J. Mostyn, C/- Tobacco Institute of Australia, which formed part of a fax sent to G. Bible, Philip Morris International on December 4, 1992 concerning a political meeting]. ACIL Australia Pty Ltd. 24 Nov 1992. Philip Morris. Bates No. 2048203747. http://legacy.library.ucsf.edu/tid/btf53e00. ACIL Australia Pty Ltd. Record of meeting held at Parliament House, Canberra on 24 November 1992 [Formed part of a fax sent to G. Bible, Philip Morris International on December 4, 1992]. 24 Nov 1992. Philip Morris. Bates No. 2048203748/3750. http://legacy.library.ucsf.edu/tid/ctf53e00. White J. Public aware of dangers: tobacco man. The Australian4 Jul 1969:5. Tobacco Institute of Australia. Submission to Senate Community Affairs Reference Committee Inquiry into tobacco industry and the costs of tobacco-related illness1994:5. Colmar Brunton Research. Project warning report: prepared for Philip Morris. 1993 Dec. Philip Morris. Bates No. 2504091380/1424. http://legacy.library.ucsf.edu/tid/ugh29e00. Webb W. Australia: health warnings and the tobacco industry [Inter-office correspondence to G. Bible, Philip Morris International]. 16 Jul 1993. Philip Morris. Bates No. 2500149167. http://legacy.library.ucsf.edu/tid/ndd42e00. Non-Smokers’ Rights Association. Health warnings on tobacco products in Canadahttp://www.nsra-adnf.ca/news_info.php?cPath = 22&news_id = 159 (Accessed 26 May 2003). Brazilian Sanitary Surveillance Agency. ANVISA Resolution—RDC 104, of May 31, 2001. 2001. Last updated: 1 Jun 2001. http://www.anvisa.gov.br/eng/tobacco/rdc_104.htm (Accessed 26 May 2003). Muthiah W. Treaty a way to seek redress. The Star (Kuala Lumpur, Malaysia) 26 Aug 2003. http://thestar.com.my/ (Accessed 3 Sep 2003). Singapore. Smoking (Control of Advertisements and Sale of Tobacco) Act Chapter 309, Smoking (Control of Advertisements and Sale of Tobacco) (Labelling) Regulations 2003 Singapore Statues Online 2003. http://statutes.agc.gov.sg (Accessed 28 August 2003). Noble T. Smokers hit with shock tactics. The Age (Melbourne, Vic) 1 Sep 2003:1. CNN. Canada study: graphic cigarette warnings effective CNN. com 2002. Last updated: 9 Jan 2002. http://www.cnn.com/2002/HEALTH/01/09/canadian.cigarettes/ (Accessed 26 May 2003). Mahood G. Warnings that tell the truth: breaking new ground in Canada. Tobacco Control1999;8:356–61. Philip Morris (Australia) Limited. Submission by Philip Morris Limited in response to ‘Review of Health Warnings on Tobacco Products in Australia’. 6 Jul 2001. Philip Morris. Bates No. 2085290470/0481. http://legacy.library.ucsf.edu/tid/ycn10c00. British American Tobacco Australia. A submission presented on behalf of British American Tobacco Australia to the Department of Health and Aged Care in consideration of health warnings on tobacco products in Australia. 6 Jul 2001. Philip Morris. Bates No. 2085290456/0469. http://legacy.library.ucsf.edu/tid/zcn10c00.